The Medicare Supplement Plan N has a copay for the doctor of $20.00 per visit, so if you go to the doctor several times a month, the cost would then outweigh the lower monthly premium. There is also the $50.00 copay if you go to the emergency room, this copay will be waived if you are admitted to the hospital. Part B Excess charge is also not covered unless you live in the states that do not allow for the excess charge. The states that do not allow any excess charges to be billed to the Medicare beneficiary. include Connecticut, Massachusetts, Minnesota, New York, Ohio, Pennsylvania, Rhode Island and Vermont. For these states a Medicare Supplement Plan N would be a great choice. 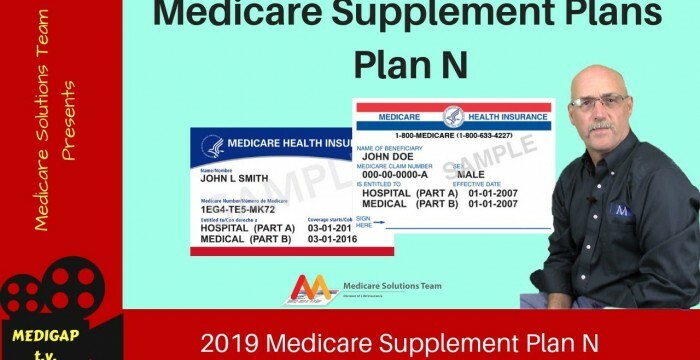 This entry was posted in medicare supplement and tagged best medicare plans 2019, best medicare supplement plan, compare medicare supplements, medicare, medicare insurance, medicare plan n, Medicare Supplement, medicare supplement insurance, medicare supplement insurance plans, Medicare Supplement Plan N, medicare supplement plans, medicare supplement plans 2019, Medicare Supplement Plans MN, Medicare Supplement Plans OH, medicare supplemental coverage, medicare supplemental plans, Medigap Insurance, medigap policies. Bookmark the permalink. A Plan N can be a very good choice for a Medicare Supplement Plan in the right Circumstances. Do you have any questions? Just comment below or call 844-528-8688. I was recommended by one of my friends on facebook to watch out your video. Great job bro… looking for more from yours. However good luck with your channel…….